Find a photo or image on the internet that you want to use to make your dot to dot puzzle. You need the URL of the image that you select. Get this by right clicking on the image from your web browser. The screen shots below may vary slightly, depending on the version of your software. 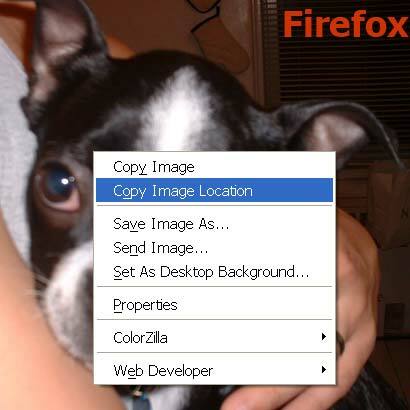 From Firefox, right click and select "Copy Image Location", as shown below. To use a photo from your computer instead of the internet, drag the photo into your browser, and then copy the URL. The URL will start with 'file://'. If you want to use local photos with Firefox, you must first follow these instructions carefully to give Firefox permission to work with local files and picturedots at the same time. There is no browser setup required for most users of Internet Explorer. You cannot use local photos with Safari, so Mac users should use Firefox instead for this functionality. ii) then select and copy the URL from the properties box. Try it now. Get the URL of the image to the left, and then paste it into this box.